A couple of links have come my way this week that got that old question bubbling in my brain. The first was a link to a trailer for the upcoming documentary Class Dismissed: Education and the Rise of Homeschooling in America. Watching it, I realized that much of it had been filmed at the summer homeschooling conference which I’ve attended for years. Intriguing as the trailer is, I think it’s sort of a shame that it begins as an indictment of schools and how they’re failing, with images of schools that look like dilapidated prisons. Fifteen years ago, when Chris and I decided to homeschool, it wasn’t to avoid schools, or because we thought schools were going downhill. (It had only been a couple of years since I’d been a classroom teacher myself.) No, it was the promise of what an education outside of school might look like. There seemed to be so much potential for developing curiosity and creativity when an education didn’t have to cater to a class, and could center on an individual child. Yes! I think my main goal in homeschooling has been to raise kids who know what their talents are, and where their passions lie. It still amazes me that I went through all those years of public schooling without really understanding what my personal strengths were. I won an essay contest as a fourth grader and always got good grades on papers, but I don’t remember a single teacher encouraging me to write. I would have loved to major in English in college but I didn’t because, somehow, I didn’t think I was qualified. Isn’t that ridiculous? I didn’t think I could major in English because I hadn’t written for the school paper in high school, and I didn’t think I could write for the school paper in high school because I hadn’t written for the junior high school paper. In school I just did what I was supposed to do. It wasn’t until college that I figured out that my interests could guide my life. 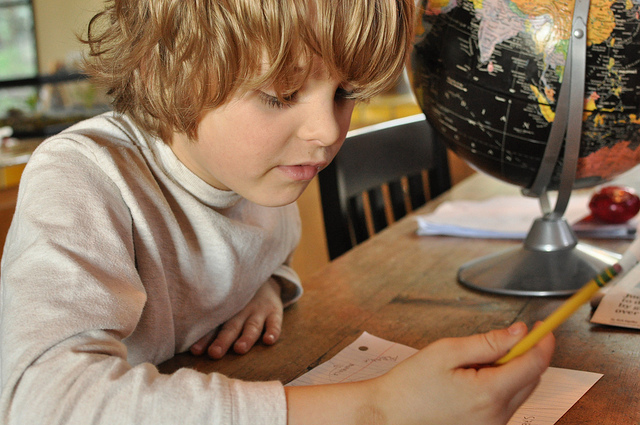 With homeschooling, my kids have been making decisions about how to learn from the beginning. They have a deep sense of how they like to learn, and they know their strengths. I’ve read that I liked being around you line three times; three times it’s made me cry. I’m not sure why. Something in that simple thought touches a deep seed of belief in me. I suppose it’s the unparalleled wonder of being there to watch a person–your child–unfold: quirky and unique and difficult and so full of potential. Being there to witness that and support it–three times–has been the most fulfilling act of my life. Oh dear, I do believe I’m sounding like a Hallmark card. But deep seeds of belief can do that to you. And he proceeded to tell me how he wants to invent a country, and he’s calling it Pentasia. His country will be near Greece, in the time of the Ancient Greeks. Sometimes Pentasia will be at war with Greece; sometimes they’ll be allies. T. plans to invent a mythology for them, as well as historical heroes. He’ll tell about their natural resources and their laws. Then he took out our globe and copied a map that included Syria at the top, and Macedonia at the bottom. But in the place where those two borders meet he inserted a space not on the globe. He simply expanded the map, drew in his own country and labelled its capital Keltamira. “And sometimes, when I’m being very mature and serious, or moping, or feeling insecure, or feeling like a total realist, I think that it’s not clear to me exactly what parts of myself I gained from school (college, grad school) and what I gained from unschooling. It’s all mixed together now. i’m going to read this one a few times. i just love that line, “i liked being around you”. at times i wonder if i’m homeschooling for selfish reasons. yet i know that keeping my kids close is good for them too. it’s that intimacy i love so much, and i believe it’s so important during these years. i’m seriously struggling with avery’s wishes for next year. sigh. Intimacy–it’s your new favorite word! I read Kate Fridkis’ article last week, and was struck by the same phrase. It hits me really close to home. I didn’t like motherhood from the beginning. Thought I would, then didn’t, then spent the last 11 years feeling terribly guilty about that fact. Loved my kids, didn’t particularly like being around them, due to what they represented: endless needs. When I started homeschooling this year, I found my niche……finally. Now, I really love being around them. It’s amazing–a redemption I hadn’t anticipated, didn’t excpect, and am relishing completely. I’m still stalking you and other child-led learning parents, trying to muster up the courage to ditch the curricula. Until then, thanks. It’s so interesting that homeschooling is what helped you find your niche as a mother. It’s not like their needs are less with homeschooling, right? Maybe it becomes less about their needs now and more about them? You can always ease off the curricula a little bit at a time. Try ditching one part–or tweaking it–for something your girls are interested in, and see how it goes! I read Kate Fridkis’ artcile a earlier this week. It’s great that people are writing about their experiences with unschooling. Being new on our journey I love seeing what grown uschoolers have to say about their journey. Mr. T rocks. How creative and brilliant, really. He wants to write a book? Well, excellent! If they want to do it, writing can come quite naturally. So glad to read this today. We are back to homeschooling after the kids decided to try school in the Fall, and I’m (at least) as happy as the kids are. I’ve missed them. And our wacky adventures. Is it smooth all the time? No, of course not. But I find the more time I spend with my kids, the more I enjoy the time we are spending together. My oldest is currently working on creating recipes — mostly candy, but I just took a cake out of the oven — for his “booth” at the homeschoolers craft fair coming up in the spring. I’m amazed at — and jealous of — his self confidence as he just rattles off ingredients and instructions, refusing to look at existing recipes for guides. And you know what? The kid is going to make a killing! I’m glad you’re back homeschooling, if that’s where you all want to be! Love the project your oldest chose for himself. Sounds he’s full of the potential that Fridkis writes about. Good stuff! I really resonate with the idea that we homeschool not to shun school, but to embrace the possibilities of learning at home and in the world. It’s not the same thing, is it? Wow. What a wonderful post. I also read that article this week and it was great. We are just beginning our journey together as our daughter is 4 and we have decided to unschool her; very exciting and scary at the same time. the promise of what an education outside of school might look like. There seemed to be so much potential for developing curiosity and creativity when an education didn’t have to cater to a class, and could center on an individual child. Welcome to the exciting and scary world of homeschooling! Hi, I want to say something about Molly’s comment. I very much relate. I am extremely new to homeschooling, but I’ve been dealing with conventionally schooling my four kids for 23 years; my oldest is 25, and my youngest is 10. I also didn’t particularly like being around my kids. In my case it also had a lot to do with the fact that I perceived them as an endless pile of need. As I began to consider homeschooling for my youngest daughter, I had already suspected that it wasn’t my kids that had endless needs, but their schools! As we are adjusting to homeschooling, we are trying never to forget what we are doing it to begin with. We our in control of our days, our nights, and many of our activities. One thing that isn’t mentioned in the article is that in most schools, kids are taught, they learn what they learn (or not), then they get a grade. Unless they fail, that’s the grade, and that’s it. When I’m homeschooling , if I think something’s important, I can make sure my daughter learns, that she truly understands. If she appears entirely incapable of grasping something, this is equally important. I need to consider what I’m doing wrong, or if there is some other problem. There are so many great things about homeschooling, aren’t there, Ingrid? It must be so interesting to have such an age span between your kids, and to experience homeschooling for the first time with your youngest. It sounds like it’s working out well for you. Great! I forwarded your blog to a couple friends to read this article. One is considering homeschooling, and the other just for encouragement in her homeschooling. Thank you. I never wanted kids. I’m nearly 12 years older than my youngest brother, and didn’t want my mother’s life, as hugely good-at-it-all as she was. And I trained as a primary school teacher, because all that learning stuff is so darned fun and interesting, and I was cocky and sure that school didn’t have to be boring the way I found it so boring- surely I could do it better. Of course I bloody couldn’t, and then we did have kids and the Mummy/housewife drudgery suited me as badly as I had expected. And why, oh why, would I send my kids away all day for the most wondrous thing about childhood, and just keep the dreary bits, cooking and cleaning and fighting about homework and bedtime, to myself? I taught elementary school too, wanderingsue, and hated the thought of giving away my kids to a classroom. I wanted to have all the learning fun with them! Thank you so much for writing this article, I needed to read it. I have been homeschooling my oldest of 3 boys for 2 years now, and sometimes I wonder if I’m crazy because as a homeschooling mama, I am in such a minority. If it was such a good thing to do, why doesn’t everybody else do it? Maybe fear of the unknown, or that one may not be able to teach or just have their children around all the time. I am also an ex-elementary school teacher and just want to be with my kids to watch them grow and get joy out of learning. I’m glad that the post was helpful, Carina! Being a homeschooler can make you feel like an outsider and an oddball, can’t it? Do you have other homeschoolers where you live, Carina? I was lucky enough to find a wonderful support group early on in our homeschooling life, and being with all of those other homeschooling families on a regular basis tricked me into thinking that homeschooling is pretty normal! I’ve also found community here on my blog, and on Twitter. Even though we may be in the minority in society at large, there are plenty of us homeschoolers out there, and the numbers grow every year. It will never be a mainstream thing, though, because most families just don’t want to take on the lifestyle that we’ve chosen. “I…just want to be with my kids to watch them grow and get joy out of learning.” Yep, that’s why we homeschool too! I have been reading your blog for a few months now. Thank you! My kids are 3 and 1 years old and I also have a stepdaughter who lives with us on school vacations. 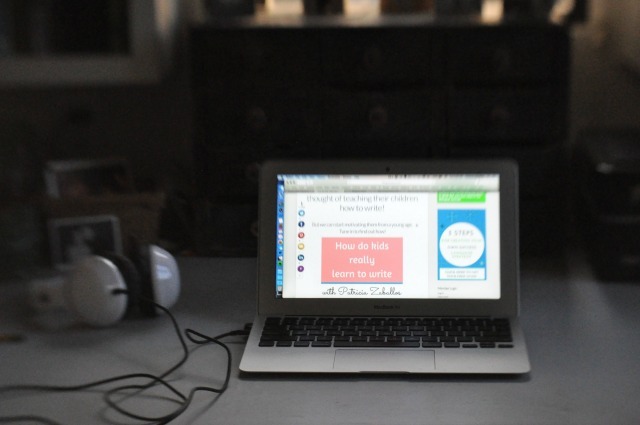 I started reading your blog as research because I do want to homeschool my kids. My son is in preschool right now, he loves it and it is small (only 7 kids) ; his teacher is amazing and I am learning so much from her. I used to think that once my kids are in school I will finally have time to write. I know that taking care of them is my excuse to not write. But I do wonder how I will do it. How will I homeschool them and make time to write and actually finish one of my projects? When do you take the time to write and what do your kids do during that time? Thank your for reading here, Maceo! 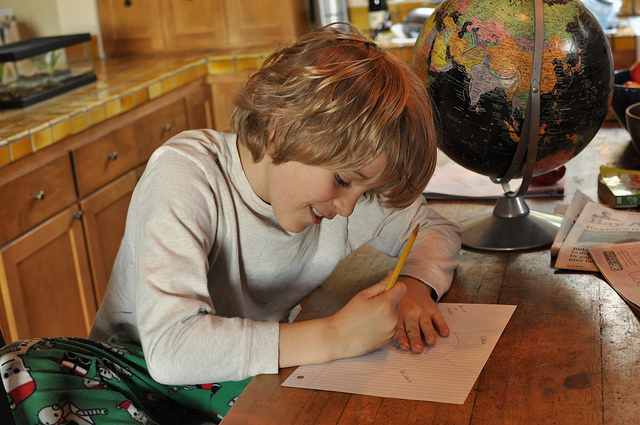 Finding time for writing can be a challenge when you homeschool. My original plan was to get an MFA once my kids were in school, but once we decided to homeschool, I had to rethink that, and let my writing develop more slowly. My habits have changed as the kids got older. One practice I started when my second child was a baby was to go out to a cafe to write one evening a week. 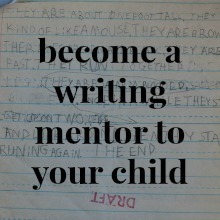 I wrote about it here, if you’re interested: http://patriciazaballos.com/2011/11/22/its-just-something-you-do/ When the kids were little, sometimes this was the only writing I managed, but doing it on a weekly basis helped me keep a little momentum going. When my kids were little and one still napped, we had “quiet time” around here in the afternoon, when they were either napping, or playing quietly in their rooms. I could write a bit then. I did some weekly exchanging of kids with other moms at times. When it was my turn to be “free,” I always used the time to write. Evenings are harder for me when it comes to writing–unless I’m out–because I just get too tired. But sometimes I would write after the kids went to bed. Once my kids got a bit older, I could work for an hour or two in the mornings, before we did any homeschooling together, and they could occupy themselves. Audiobooks were great for encouraging them to be independent–the older two often listened to stories together in the morning, played Legos, etc, and I could work at my computer. That’s still when I get most of my writing done these days. I admit to sometimes envying writing mothers that I meet or read about, who write when their kids are in school. But I wouldn’t change our path for anything! It’s just meant that I’ve had to be more disciplined and patient with my writing. 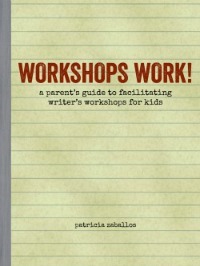 Oh, you might enjoy reading this essay I wrote a few years back, called “Homeschooling My MFA.” http://patriciazaballos.com/homeschooling-my-mfa/ It sums up what I’ve done with my writing, and why it’s been worth it to me. Hang in there, Maceo! You can find time to write if it matters to you. And it will be such a good thing to model for your kids. Thank you so much, Patricia, for your thoughtful response. I really appreciate it. I signed up for a craft writing class online with Book Writing World. My goal this year is to write a sentence a day. So far, I am actually surpassing my goal each day! Good for you, Maceo! Breaking goals down into tiny steps is what works, isn’t it? Keep those sentences going! I’m so glad I stumbled upon your blog. I Live in oakland and my son is only 2, but I’m already thinking about how I don’t think mainstream education is going to be the best fit for him. I’m really interested in homeschooling, my main concern is the social aspect of school. Do you have any posts you can refer me to that is about this? And if not, do you have any guidance? I love the idea of child led learning but want him to have quality and diverse social interactions. I worried he would someday be resentful of me isolating him. Thanks so much! Hi Kristen, I’m not sure if I have any posts that speak to this directly–but there are a lot of posts about the wonderful things my kids and I have done with our homeschooling friends over the years! I certainly understand your concerns, and I had them too in the beginning. But I can honestly say that the fear of homeschooled kids being unsocialized is mostly a stereotype. There are so many homeschoolers these days. I live very near you, and I can assure you that you there are events and activities and park days for homeschoolers happening in this area every day of the week. My husband often joked with us early on that it was ironic that we were “homeschoolers” since we never seemed to be home! Our family has been in the same homeschooling support group for 18 years. What started as a weekly park day developed into friendships for my kids and me that I never could have anticipated. We meet with our homeschooling friends several times a week, for various different activities, and just for fun. The homeschooling moms I’ve met over the years have become my own closest friends. My husband has also become good friends with many of the dads. My oldest, now 22, lives in New York–with a roommate who has been a buddy since they were eight-year-old homeschoolers! I imagine that it might be more of a challenge to develop a social circle if you homeschooled in a more remote place, but here in the Bay Area your biggest problem is likely to be too many social options! (I had to learn to say “no” in the beginning, so we’d have enough time at home as a family.) Neither of my two grown kids felt that they were isolated growing up; on the contrary, I think they had a very supportive social circle of great kids, whose families were very involved in what they were doing. I’d recommend you try bringing your young son to a local park day, and talk to the families there. I started going to local park days before my son was of kindergarten age; it made it easier not to worry about skipping kindergarten by the time we got there, as we already had a circle of homeschooling friends at that point. Once you get to know other homeschoolers, homeschooling stops seeming like such an alternative thing. It starts to feel surprisingly normal.